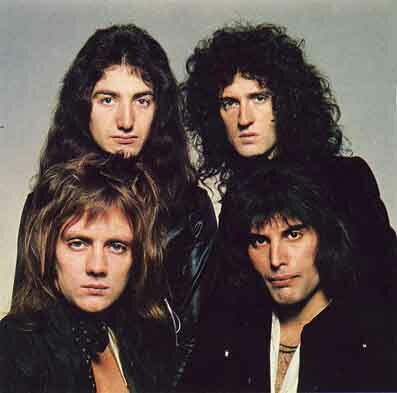 Queen was a glam rock/heavy metal band that started out in 1971 after guitarist Brian May and drummer Roger Taylor, who together had been in several bands, decided to form yet another one and joined up with vocalist and some time piano player Freddie Mercury. After a short time bassist John Deacon joined them and in 1972 they were signed to EMI Records. Their first single "Keep Yourself Alive" was released shortly thereafter but didn't sell well. Then their debut album Queen came out in '73 with a combo of glam and hard rock songs on it. It wasn't till 1974 that they would make it big with their third album Sheer Heart Attack. It went to number two in the UK and the album's single "Killer Queen" became the band's first US hit, just missing the US top ten. They also started to make a name for themselves, especially Mercury who early on would always be satin-clad and was one great showmen on stage with his theatrics. He also had one hell of a singing voice, too. It was the 1975 release of the masterpiece A Night At The Opera which would make them superstars. The album would go to number five in the US, but in Britain it went to number one and stayed there for nine weeks. The album had a little bit of everything including the seven minute single "Bohemian Rhapsody", a mini opera written by Mercury. It was the one rock opera that truly sounded like a opera, even with May's great heavy metal guitar riffs. With many vocal overdubs, hard drumming, mellow piano, the song became their fans most loved. They also put together one fine video for the song, which in the pre MTV days wasn't really done too often. No cost was spared for the song and it took a month to complete. But A Night At The Opera also had other great tunes on it and all the band's members helped in writing several of them including Deacon's "Your My Best Friend", which was perfect for Mercury's voice, and Taylor's heavy metal lead vocal, drums a pounding "I'm in Love With My Car". The next album, A Day At The Races, released in 1976 was another hit and included the single, "Somebody To Love". Then in '77 the release of News of the World went top ten with its double A sided "We Will Rock You", written by May, and Mercury's "We Are The Champions". "Champions" was supposedly a gay rights song that was pretty much overtaken and and still today used as an anthem for champion sports teams worldwide. In 1978, still more success came Queen's way with the release of Jazz with yet one more double A hit single, "Fat Bottomed Girls" and "Bicycle Race". Queen was at the peak of their popularity as they entered the decade of the 80s. The Game was released in early 1980 and became their first US number one album. It also contained four hit singles, "Crazy Little Thing Called Love," an Elvis like song, the somewhat disco sounding "Another One Bites the Dust" and "Play the Game". A fourth song "Save Me" was another British hit. For whatever reasons, this would be the last real big Queen album in the States and as the eighties went on they seem to fade there. But back home in the UK things still were going strong. "Under Pressure", recorded with David Bowie went number one in Britain in 1981 and in '84 they went to number two on the UK charts with "Radio Gaga". Then they played a great show at the Live Aid benefit concert in 1985. In '86, A Kind of Magic sold great in the UK and the rest of Europe, but it failed to sell at all in the States. The same fate was to come to 1989's The Miracle. 1991's Innuendo did a little better in the US, peaking at number 30. But by early 1991, the end was near for the band. Mercury was gravely ill with AIDS, although his fans didn't have a clue at first. Later in the year stories started to go around about his health and on November 22, he issued a statement confirming he had AIDS. He died just two days later. Mercury who was known for throwing big expensive parties would be honored by the surviving Queen members and his friends in one last Queen gig. It was held at London's Wembley Stadium on May 20 1992 and televised worldwide. Featuring such guest artists as Bowie, Elton John, George Michael, Annie Lennox, Def Leppard and Guns N' Roses, the concert raised millions for the Mercury Phoenix Trust, which was established for AIDS awareness. Also at this time the song "Bohemian Rhapsody" was reissued to also raise money for AIDS research projects, and soared to the top of the British charts. The song also climbed to US number 2 after being featured in the movie Wayne's World (it had originally reached US number 9 in January of 1976). Surprisingly, there would be one last studio album issued by Queen. In 1995 May, Taylor and Deacon got together and added new music to backing tapes of vocal tracks that Mercury had recorded on his death bed. The album, Made In Heaven received mixed reviews. But like so many other Queen albums, it sold real well and the surviving band members did a grand job in putting it together. One last tribute to a much loved and missed guy.